Rating: Maybe, One More Try!! 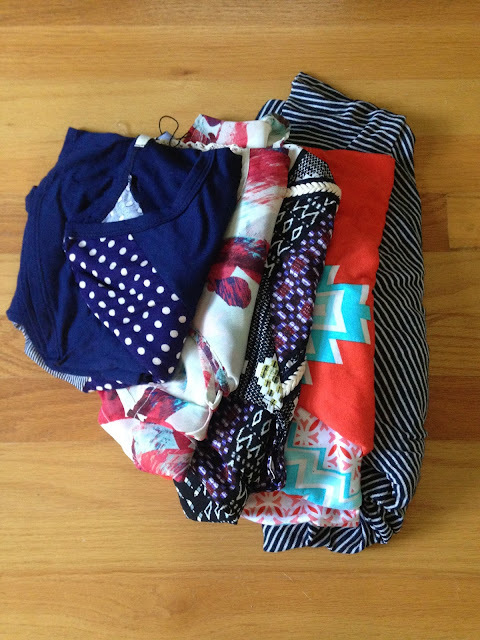 I tried a new clothing surprise box from The Relish Clothing Company. This company was started by a woman who is the mother to five children and runs the company on her own. It's new and was started early June 2015. I'm sure she'll expand quickly, because she has quite the following and the surprise clothing boxes are amazing! There is a Facebook group dedicated to showing reveals and trading of the Relish Mystery boxes. I've seen some beautiful clothes I was hoping to get in my box. When you place your order you are able to put comments of your measurements, likes, dislikes, items you hope to get, etc in a "What do you Relish" comment box. You can also tell her your Pinterest link, so she can see what your style is and what you might like, similar to the way Stitch Fix uses Pinterest. There are 3 different size boxes available on the website and also a newly added accessory box. The small mystery clothing box is $99 and contains 4-5 pieces. The medium mystery clothing box is $149 and contains 6-7 items. The large mystery clothing box is $199 and contains 9-10 items. The small accessory box is $99 and contains 4 accessories. The large accessory box is $149 and contains 6 accessories. It is a great value because the clothing and accessories are high end, trendy, boutique quality. To start out I ordered the small Relish Mystery Clothing Box for $99. When my box arrived I was away on a business trip, so I couldn't wait to get home and see what I received. When I opened the box, I saw a lot of color, but wasn't too sure what I received. I was hoping for some cute stuff I had seen in reveals, but nothing looked familiar to me at first glance. There was a ring pop included too! My 3 year old daughter grabbed that immediately and ate it before I even looked at what I got. As I looked at what I received, I knew there would be some fit issues. Some of the items I received looked too over-sized for my little frame. Because some of the items really looked terrible on me, I decided not to take styled pictures. So, unfortunately I only have pictures of the items. Here is the stack of everything I received. The first item I received was a Collective Concepts tank top with crochet detail. I really liked this shirt. It fit well and was cute! I loved the detail and print and cute floaty layered look. 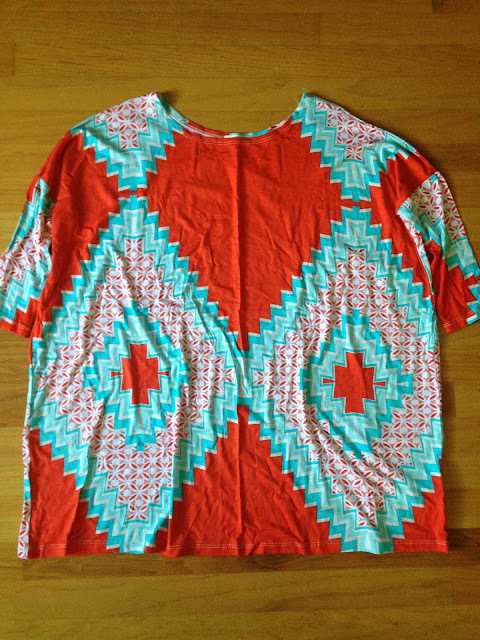 I think this would be great to wear to work under a cardigan or blazer. I also received a Le Lis long sleeve navy t-shirt with polka dot detail. 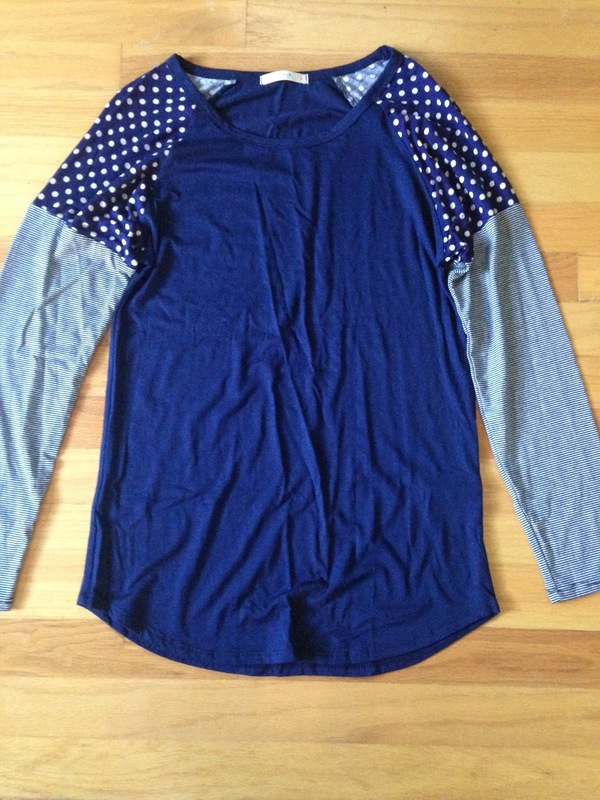 I love polka dots and this looked like a simple t-shirt, so I thought I'd really like it! But when I tried it on it was very large and droopy in my armpits. I'm not sure why, because I've never had a shirt fit me like that before. Unfortunately, I knew I could never wear this shirt. The next item I received was my favorite one in the box. It's a Collective Concepts shirt. 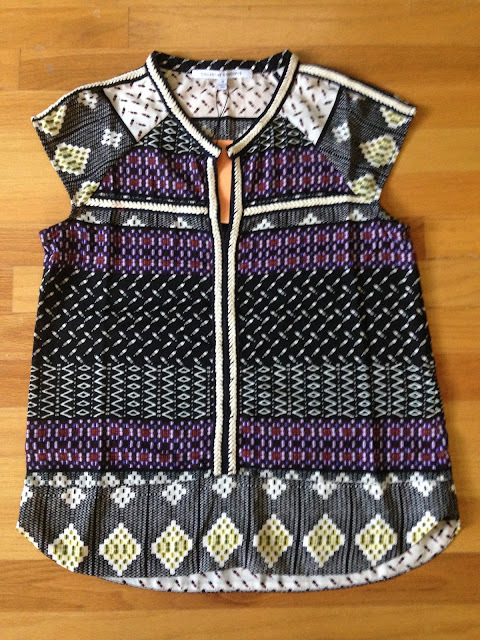 It has a pretty black and purple print. I really liked how unique and different it looked. It also had a cute rope like detail that I really liked. This one fit perfectly! 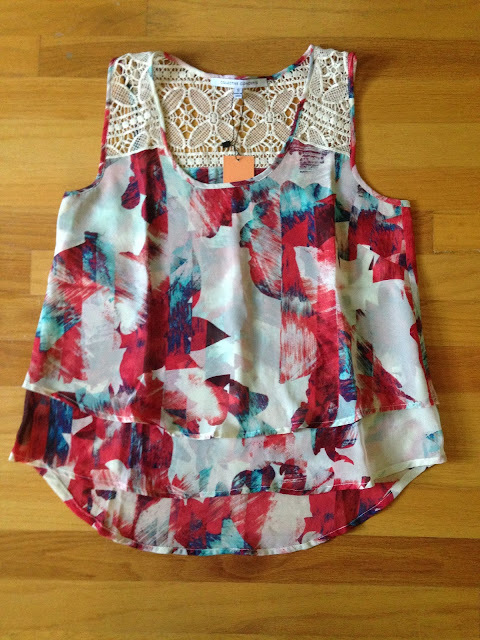 It would be perfect for work or a night out with friends. This was totally my style and I was so happy it was chosen for me. The Fantastic Fawn tunic was my least favorite item in the box. I wasn't crazy about the color/pattern out of the box. Then when I opened it up it looked very over-sized and I knew it wouldn't work for me right away. I need clothing with some shape, because I have a very boyish, straight figure. This is the reason I did not take pictures with me wearing the items. This didn't work on me at all. It just looked like I was wearing someone else's shirt. And it was a strange length. I've never been able to pull off the tunic length too well. It might have been better if it was longer and I could belt it and wear it as a dress, but I'm not sure that would have worked on me either. A lot of people may have loved this item and it was really soft, but just not for me at all. 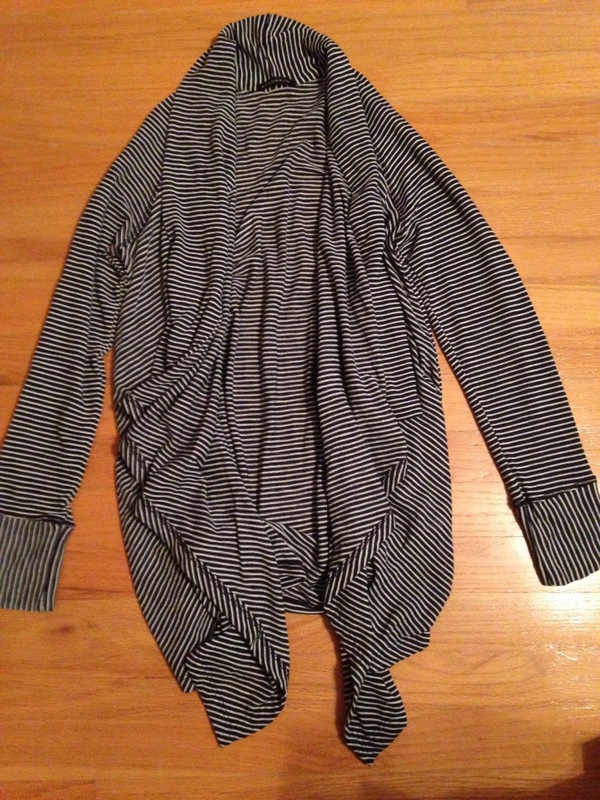 The last item I received was a Staccato cardigan. I love cardigans, but I prefer cardigans with buttons, because I think they look more professional and are more versatile in my wardrobe. I wear a cardigan almost every day, so I also have similar items in my closet already. It was comfortable and fit well, but I wasn't too crazy about all the extra material in the front. It didn't seem to drape well on me. And I apologize for the picture because it's awful. It was hard to show what it was and capture the drape in the front all at the same time. Unfortunately, I wasn't too crazy about my box. I knew 2 of the items I wouldn't be able to wear at all and the cardigan was okay, but not something I would grab for often. The only 2 items I could see fitting into my wardrobe were the Collective Concepts shirts! Now, I had a few options. I could keep the box and trade the items that didn't work for me on the Facebook group. But I thought it'd be very difficult, because just about every reveal I had seen had received the navy t-shirt and a cardigan either the same as the one I received or similar. I figured that wasn't the best option. Relish also lets you return the entire box for a full refund. And the final option is something unique to Relish, you can exchange the box for different surprises. You send your box back and Relish sends you a replacement box with new items. Because more than half the box didn't work for me and I couldn't justify spending $100 on 2 shirts, I decided to exchange the box for new surprises. My box is already on it's way back to Relish and I can't wait to see what I get. I also included a note saying I'd love to see the black/purple Collective Concepts shirt in my replacement box, so hopefully I get it back! I was sad to let that one go. I'll be sure to review my replacement box when I receive it. UPDATE: I was waiting for my Relish Clothing exchange box, but the company decided to no longer offer exchanges, effective immediately. Since my box was shipped backed weeks ago, but I hadn't received my new box, I wasn't sure if I would be affected or not. I assumed the company would send exchanges for the boxes that had been received and going forward would not offer the option to exchange, but effective immediately, meant IMMEDIATELY. I received a refund shortly after the announcement was made, so I won't be receiving an exchange box. I decided I'll let this company work the kinks out before ordering again, it's very new, so I understand they are still trying to figure out what works for them.